Pain or cramping in a muscle is a common post-exercise injury that can happen to anyone. Most cases of pain in the upper inner thigh after walking on a treadmill do not require medical attention, although people with symptoms that worsen or persist should seek medical evaluation. Fortunately, most cases of pain in the upper inner thigh are preventable with lifestyle changes and are treatable with home or medical care. 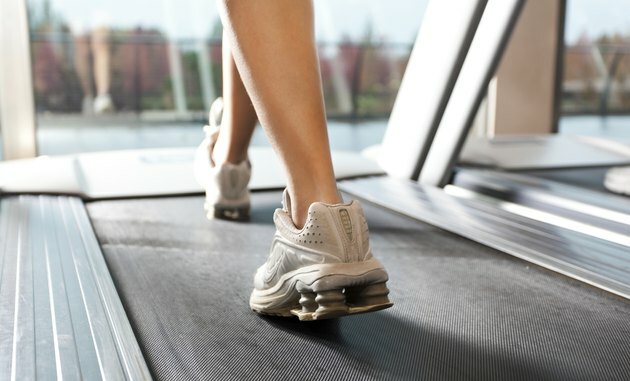 Pain in the upper inner thigh that occurs after walking on a treadmill might develop slowly and feel like a dull ache, or may come on suddenly and feel like stabbing or burning pain. In some cases, the pain might not start until the day after a workout. In addition to pain, some people might experience additional symptoms, such as swelling or bruising in the upper inner thigh, weakness when trying to squeeze the legs together and difficulty with walking or running. In some cases, a hard lump might develop within the muscle, which might feel tender to the touch. Poor flexibility and failing to warm up before using the treadmill are common causes of pain in a muscle such as those in the upper inner thigh. According to the Sports Injury Clinic website, a tear in the adductor longus muscle, also referred to as a groin pull, can cause pain in the upper inner thigh after using a treadmill. Muscle cramps can also cause pain in the upper inner thigh after walking on a treadmill. Cramps often result from prolonged workouts, dehydration and fatigue. Rarely, medical conditions such as a compressed nerve, arteriosclerosis or diabetes can cause pain in a muscle after exercising. In cases of mild pain in the upper inner thigh after walking on a treadmill, home treatment such as rest, ice and elevation of the affected leg can reduce pain. Gently stretching the muscles of the groin area can also help reduce pain in the upper inner thigh, says the Sports Injury Clinic website. If the pain interferes with walking, doctors might recommend using crutches until the pain subsides. For moderate or severe muscle strains or tears, patients might require massage therapy, physical therapy or surgery to repair the muscle. When using a treadmill, slowly increasing the rates of speed and incline during a workout can help prevent pain in the upper inner thigh. In addition, stretching the muscles of the thighs and buttocks a few times a day and warming up before and cooling down after using the treadmill can also help prevent upper thigh pain. Performing muscle-strengthening exercises such as squats can also help prevent pain in the upper inner thigh, says the National Library of Medicine website.